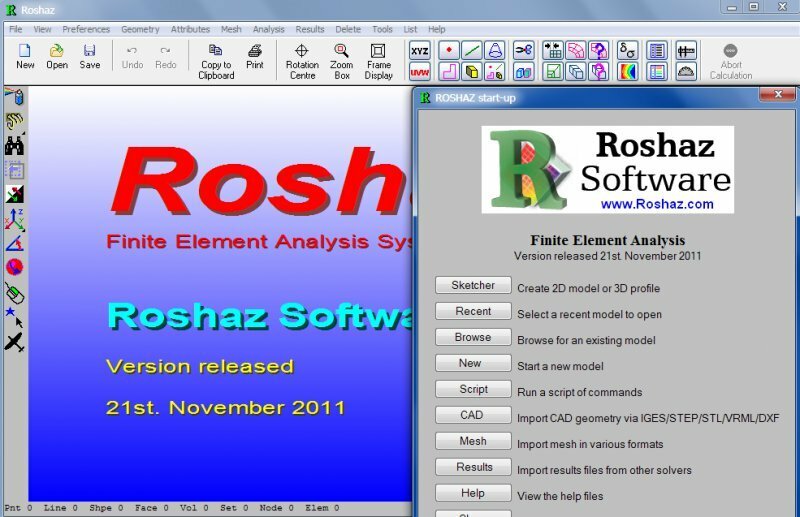 Roshaz is a complete finite element analysis suite. Geometry to describe a problem can be built within the program or imported from CAD systems via an IGES neutral file, a STL file (stereolithography information) or a VRML file (virtual reality modeling language). Powerful utilities are available to clean up and heal any problems within the CAD data. The problem type may be one involving plane stress, plane strain, axisymmetric. shell or solid elements. There are no restrictions on geometric complexity. Triangular or quadrilateral elements can be generated on two-dimensional faces with unlimited numbers of sides and voids (holes). The same applies for three dimensional shell elements. Volumes and or faces may be divided into smaller parts using either a planar, cylindrical, conical or spherical cutting shape. Element formulations may be linear or parabolic. Material properties, restraints and loading conditions are assigned to the geometric entities, which are used to generate the mesh. Hence the mesh density can be altered without having to redefine any boundary conditions. Tetrahedral elements are used to mesh volumes, which can be of any arbitrary shape or complexity. Alternatively a shell mesh of either triangular or quadrilateral elements can be extruded to create either pentahedral or hexahedral elements respectively. Orphan meshes (nodes and elements not associated to any geometric entities) can be imported in a variety of leading solver formats. Simple analytical shapes can then be constructed and fitted to the imported mesh and used to apply loading, restraints and coordinate system transformations. Geometry can be created on a mesh and by using shape projection and face concatenation tools a geometric model can be reverse engineered from an orphan mesh. Results can be displayed on specified entities as well as the whole model. Interrogation of any entity type or result is quick and easy. Graphical displays can be imported into other applications via the clipboard or output in a variety of file formats. Input data file decks can be exported for several leading analysis systems. Geometry can be exported in STL or VRML format. * The only limitation of the demo version is that there is a 5000 node limit when meshing. 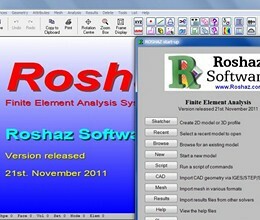 * ROSHAZ download link provides demo version of the software. SCAD for Windows is a new-generation system developed by engineers for use of engineers and implemented by a team of experienced programmers. ROSHAZ has been rated 5.0 out of 5 points. A total of 1 votes cast and 0 users reviewed the software.